Inside Our Kohl’s x Studio Tone It Up Event ~ All The Pics! 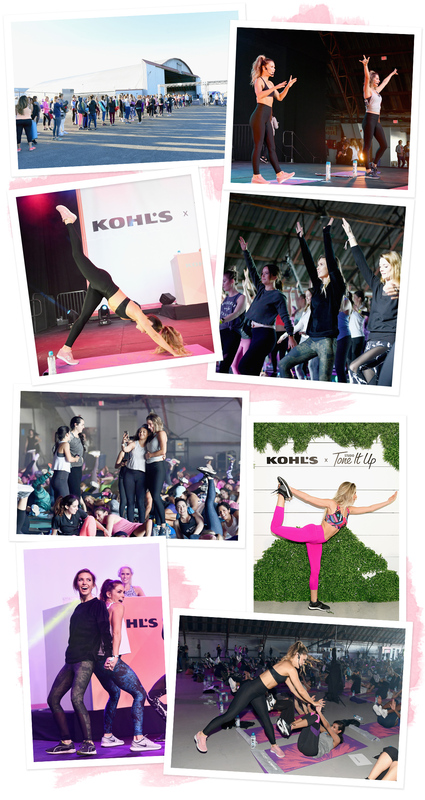 A few weeks ago, we had the most amazing Kohl’s x Studio Tone It Up event in Santa Monica. Hundreds of women came together to work out, get pampered, sip Tone It Up Protein smoothies, and shake our booties! There were six workouts — from HIIT to yoga sculpt to dance cardio — with us and your kickass Studio Tone It Up trainers. The event brought the Studio Tone It Up experience to life and the energy was 🙌🏻💃✨ Plus thousands of girls joined our total body sculpting workout on Facebook LIVE! You can still do it with us HERE! A HUGE thank you to everyone who joined us in Santa Monica and on Facebook! And it was so much fun partnering with Kohl’s to make this all come to life. We’re so grateful for such a special day! We’re sharing all the pics and memories below! Chyna kicked some major booty in her cardio kickboxing class! We were so thrilled surfing champ & Tone It Up Athlete Sage Erickson and boss babes Ashley Greene and Audrina Patridge joined! These bombshells are so much fun and crushed the workouts! The incredibly fierce and fab Catt Sadler was in the house!! Thanks Priv for pampering our girls post-workout!